The most interesting question about Latin at the moment is whether it will ever succeed in becoming a spoken language again (I believe it will), and to answer this question a comparison of the language with the country's population growth as a whole is largely irrelevant, especially since the mid-1990s when the internet came to the fore. That is, whether a language can be revived or not does not depend on the number of speakers or users compared to the population as a whole, but rather whether it's possible for a new student of the language to find other people to use it with and effective enough resources to use it. 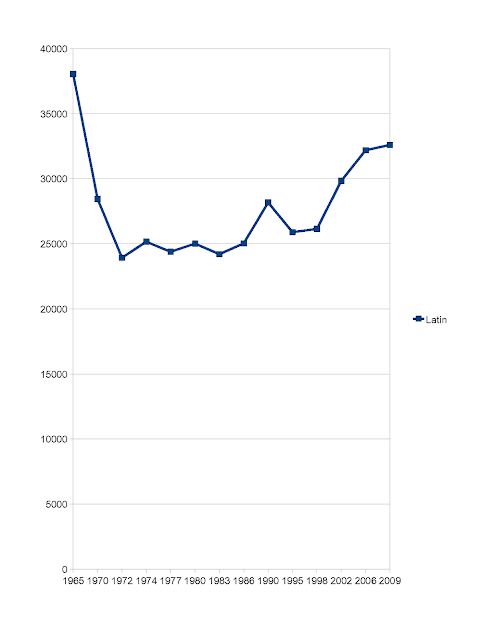 The numbers for Latin from the mid-1990s go from about 25000 to 32000, which is modest but welcome growth. Also keep in mind that techniques for teaching the language have changed quite a bit since Latin was a necessary subject for a classical education. In the 1900s Latin was more necessary than now but was still treated more as a subject of study rather than a living language (see this PDF showing a Harvard exam in 1869 for an example of that), whereas now it's rare to encounter Latin as a necessary subject in university, but those that choose to learn it are able to learn it more as a spoken or living language, with a lot of conversation, drama, translations of modern books, and other such fun things. This account on YouTube is a very good example of that, as it has far, far more spoken material than written. I believe that the most effective way for Latin advocates to revive it as a spoken language would be to choose one or two locations to concentrate on (maybe one in the United States and one in Europe), which would then effectively become travel destinations for Latin students who want a bit of immersion in the language, and anyone else who is curious about this one part of the world where spoken Latin can actually be heard. I've detailed that plan a bit here, and tentatively think somewhere like Clifton Park in New York (where there are already a lot of Latin students) would be a good place to try it. Imagine a Latin village, a street or two where the street signs and menus have Latin translations, a few universities have decided to participate by teaching classes there, and even regular shop workers are expected to know a few phrases in Latin because they are sometimes spoken to in the language by eager visitors to the neighborhood.